Almost one year after the fire on May 5, 2010 that ravaged the Coney Island Arcade, the burned ruins of the building at West 12th Street and the Bowery are being prepped for demolition. On Thursday, Coney Island photographer Eric Kowalsky took these photos of the water-damaged arcade machines being removed and disposed of in a compacter. Charred pieces of wood were put in a dumpster. The now empty remains of the building are expected to be demolished next week. 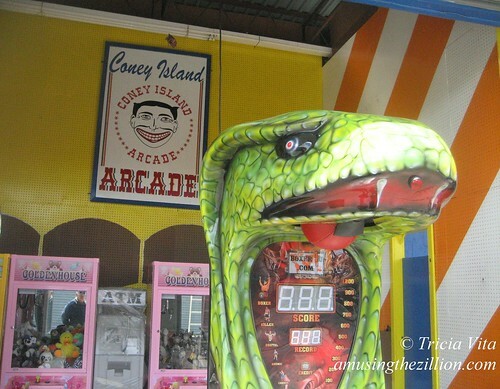 As previously reported in “Coney Island Arcade Debuts Cobra, Braves Loss of Arcade” (ATZ, April 13, 2011), arcade owner Manny Cohen continues to manufacture and distribute arcade machines under the Coney Island Boxer brand. He also operates games on the Bowery, but there’s space for only a handful of arcade machines as you can see in the photo below. The Coney Island Rumor Mill is saying that Jeff Persily, the owner of the building, has no plans to rebuild. But we certainly hope the empty lot gets rented out for something amusing this season. The arcade building is adjacent to Thor Equities’ empty lot at Surf Ave and 12th Street, where the Bank of Coney Island and game concessions stood for decades until last year’s demolitions by Thor. We’re sad to report that if Cohen is unable to find another location, his 12th Street arcade will join the ranks of Coney’s lost arcades. Among the arcades that have closed due to the redevelopment of the past few years are Astroland’s three arcades and the Fascination arcade in the now-demolished Henderson Building. Coney Island’s last remaining arcades are located in Deno’s Wonder Wheel Park and the Eldorado on the Bowery. Last summer, Foster Kamer wrote a piece in the Village Voice titled “The Five Best Video Arcades in the City.” Two of the three–Coney Island Arcade and Chinatown Fair–are now closed. on April 29, 2011 at 11:32 am | Reply Lisanne! 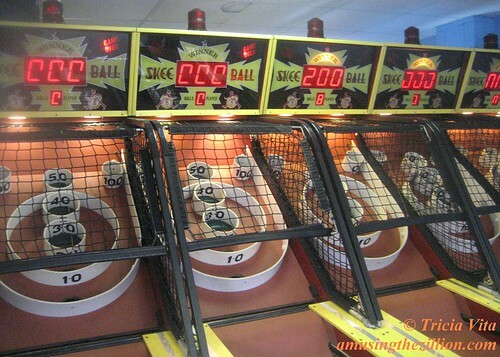 Arcades have been dwindling for years. Four years ago I had a small hope that perhaps Coney Island would still be have a number of them into the foreseeable future. My faith has been shattered in even this. The large number of arcades used to be part of the interestingness that made Coney Island what it used to be. But that was long ago. I do hope that there is some way of finding space for at least Cohen’s arcade. This subject of the dwindling number of arcades has been in the news since Chinatown Fair arcade closed. The remaining year round arcades and places where one can play skeeball year round in NYC are in a bar-type setting, so that’s out for kids. Why not use the child’s building, until they decide to build that catering restaurant? I was very sad to read about the fire a year ago and wow, it hurts to see that cabinet being demolished. (I live a couple thousand miles away but I played in that arcade when I visited NYC!) Great/sad picture, Eric.